This Place of Worship was founded in 1304, and we understand it is still open. 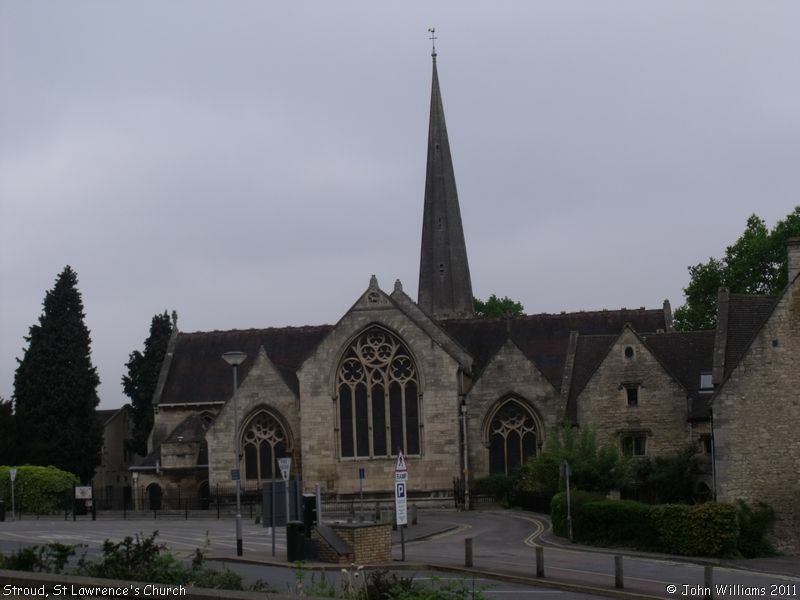 Stuart Flight's website tells us this was Stroud's original parish church, "originating from a chapel mentioned in the ancient Composition of 1304, the old church was demolished in 1866, the last service being held there on Sunday, July 8th, 1866". A new church, incorporating the old tower, was built on the same site, designed by architects Wilson and Wilcox of Bath. During the construction of the church the congregation had met in a tabernacle on Slad Rd. St Lawrence's is now a Listed Building, for which see the British Listed Buildings website; and the notes on <Stroud Genealogy on Stuart Flight's "Glosgen" website may also be of interest. Old Maps show it had a graveyard to the north of the church on OS 1884 1:500 Town Plan, and then later on OS 1936 1:2,500 an area surrounding the church on the south and west was also marked as a graveyard. The latter is now a park, overlooking Landsdown. St Lawrence's Church, Stroud shown on a Google Map. Information last updated on 8 Nov 2018 at 17:11. This Report was created 24 Mar 2019 - 10:04:22 GMT from information held in the Gloucestershire section of the Places of Worship Database. This was last updated on 7 Feb 2019 at 07:45.